With NaNoWriMo and therefore many people's stories coming to an end (congrats to all of you who did it by the way! Get yourself something nice! ), a lot of storytellers are now faced with the dilemma of where to go next. While writing another story should always be on the horizon, there also is the difficulty in determining when your story is actually completed and what is next for it. For many artistic mediums, like painting, deciding when you're done with a piece is slightly more tangible. But for storytelling there always runs the risk that you'll over-edit or remove bits of your story that make it you, such as the fun parts that I believe every story needs. So how do you determine when to stop working on a piece and declare it done? First, let's evaluate what it means for a story to be "finished." What does it mean for your story to be finished? As a storyteller, "finished" can mean a variety of things. It can mean you are finished with writing a draft, it can mean your finished with editing a story, or it can mean something bigger and far more frightening - it can mean you're completely done with your story altogether. Determining when you're finished with most writing phases is easy, but how do you decide if you're completely, 100% done? As in you don't need to do any more work (or more than likely are forcing yourself not to for fear of going crazy) and you're ready to send it out to some editor or production company who will tell you your story is not actually finished like you thought and needs more work. Or maybe if you're opting to self-publish, this means you're ready to start that process. Regardless, for the sake of this post, finished means you are at the stage of your story where you no longer intend to edit it and change things - at least by your own accord. 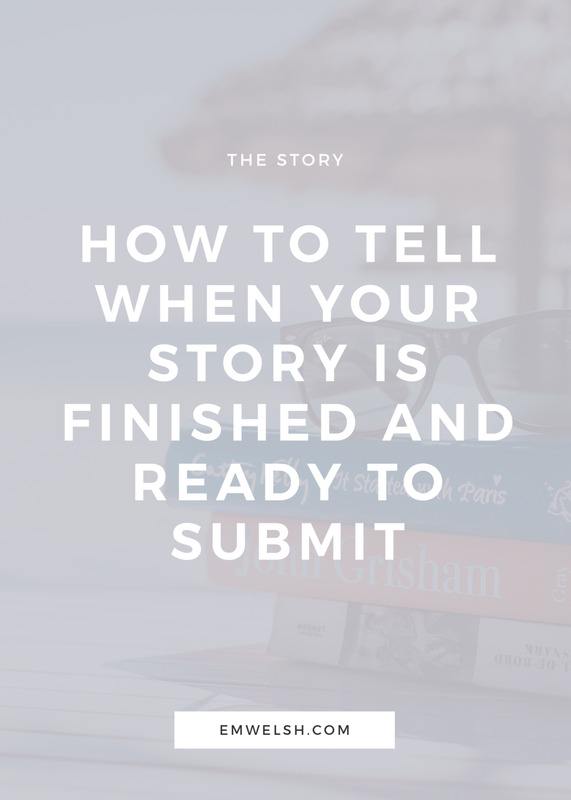 So now that we've clarified what it means to be finished, we can look at a step-by-step process to review your story and determine if it's really done, or if you need to work on it more. This will also help you analyze whether you're nitpicking or over polishing your stories so that they lose your voice and some of the mess that make them so great - which you should always be wary of! The process to determine if you're story is complete will look a lot like the editing one, only you should go through it after you have declared your work "done," and therefore are looking at this piece as a finished project. While it may seem like there's hardly a difference, think about how you read published fiction versus works in progress. While you may find flaws in the published works, your eye is far less critical and more immersed in the story. This perspective should be the one you strive for then when you are ready to read your work as a completed piece. As soon as you are finished with the final stages of your piece, I urge you to tuck it away for about six weeks or longer if you wish. If you are under a time constraint for some reason, take whatever time away from it you possibly can given your circumstances. Whatever time you choose, this tactic is the timeless one of forcing you as a storyteller to distance yourself from your work. If you try and look at your work too soon, you'll be too familiar with your work and therefore highly critical and risking the possibility that you may fix or edit out things that are very good. By giving yourself time away from your work, you become a stranger to it and can delight in what makes it so good, but also notice any remaining flaws that jump out at you. If you reach this stage and are satisfied with your story or find a few flaws that need a bit of quick touch ups, consider yourself nearly or completely "finished" with your work. However, if after six weeks you find some jarring flaws that make you squirm, it's worth transitioning to step two. After you have personally determined your work is complete, you need to show it to readers - again. If you haven't let anyone else ever read your story until now, then you are not finished. Sharing your work for critiques and notes is an essential part of editing, and you have therefore skipped out on a major part of the process. When showing this final draft to friends and family and other readers, it's important to present this piece as finished. The reason for this, like the previous step, is to convince your reader that you believe this work is done and that you aren't asking for another pair of critical eyes. As storytellers, we can really only take so much criticism in the first place. If we take too much, our story becomes someone else's work and not our own. Hence, for your completed draft you need to find a balance between accepting and rejecting these types of notes. Find someone who you believe can maintain this balance and who will only tell you a note if they believe it aligns with your own personal voice as a storyteller. You need to find someone who can read your story without wanting to interject how they would do it better, but how they think you could. If you have managed to find someone in your life great at this skill (it's hard, trust me) and they think it's solid, then you are closer to being able to say your work is done. However, even if your reader has a few more notes, if you have a strong sense of what your story is saying and you believe it's finished, you should be able to easily perceive whether these notes would make your story better or not. It's about feeling out what people say, but generally looking for positive reactions. In order for your work to be finished, it needs to be doing all the things you want it to do. While it may not do them perfectly and sacrifices had to be made, you need to ensure that you believe your story is something you like and are proud of, but also embodies ideas that you want it to. There is no better way to do this than through a mock interview with yourself or if you're feeling comfortable you can even have a friend interview you. As cheesy as it sounds, doing this will force you to talk out your story in a way you might not usually and come to terms with your goals for your work. Why did you write this piece? What are you trying to say? Do you think you express that it in this story well? What are some themes you are exploring? What do your characters represent? Are there things you would change? While you shouldn't skip the second step, if you are having trouble finding a writing partner, taking a leap of faith and sending your story out is another way to get feedback on your story as well as analyze whether you think your piece is done or not. Whether this means sending it to competitions or to schools in your portfolio, taking this next step is an indication that you feel the piece you've created is good and nearly if not completely "finished." Though it may seem against the original intuition of this post to be asking experts for advice on your story, if you are at that phase in your work then it likely means you are confident enough in your version for you to let someone in the field read it and therefore close to being able to call it "finished." Finally, just like with all other phases of editing, it's time to put the piece away, but this time for a very long time. Move on to other projects, new ideas, failed attempts. Move as far away as you can from your story to find new ones, but be sure to keep it handy and continue sending it out to the world whenever you can. That's the only reason you should be bringing your piece back out. Otherwise declare your story finished, pat yourself on the back, and begin writing some new story that will be just as difficult to determine its end. What's important is that you force yourself to accept that your story won't be perfect and leave it the way it is, uniquely you. Of course, no work is truly ever "finished." But unless you intend to drive yourself crazy, always reworking the same thing for fifteen years straight, you'll never make progress as a storyteller. Even the greatest writers look back at their old work and wish to change things, but because their work has been published or made into a play or something of that sort, they are forced to live with these errors and see the beauty in them. And so for the sake of your sanity, I urge you to treat your own work, whether it's published or not, the same one day, whenever you think it's ready. Not even close to the end of your story yet? Read my post on tricks to getting out of the middle of a story. And tell me below how you decide when your work is done!